Every year, Thanksgiving serves as an excuse for people to eat as much as they want without feeling too bad about themselves. Everyone else is doing it, right? This is where we are wrong. Thanksgiving does not have to be about gaining 20 pounds or tripling your caloric intake for the day. Instead, just a few small changes could make a big difference. I have listed some traditional Thanksgiving dishes that, with a few simple substitutions, can be altered to reflect a healthier, though still delicious, Thanksgiving meal. Follow these examples and you will be closer to a guilt-free Turkey Day in no time. As the main course, most people go for the turkey, so it’s essential to find a nutritious recipe that is both delicious and less unhealthy than than the traditional kind. 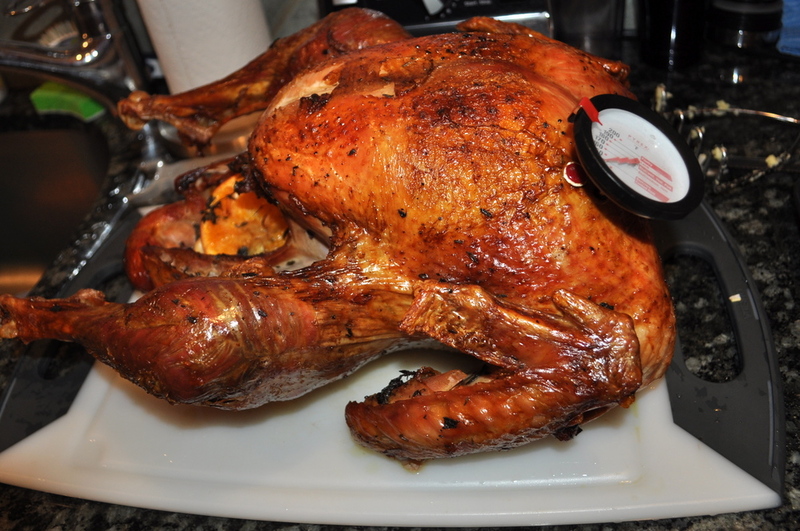 Rather than loading the bird up with butter, use some orange juice to give it flavor. If you don’t like the slight citrus bite, try using grape seed or safflower oil. Grape seed oil comes from the grapes used for wine. Compared to olive oil, grape seed oil is low in saturated fat and contains only 14 grams of fat per serving, one gram of which is saturated. The other 13 grams are healthy fats. Safflower oil is also low in saturated fat and can help boost the immune system. Another substitution to reduce the amount of sodium consumed with the turkey is to use low-sodium vegetable broth instead of regular chicken broth. Since the turkey has enough meat flavor on its own, the vegetable broth substitution will hardly be noticeable. Eating turkey never felt so pure and satisfying. The stuffing is probably the second most important part of the Thanksgiving meal. While it usually contains meat, there is no Thanksgiving handbook that says it can’t contain vegetables instead. Try substituting golden raisins and walnuts (above recipe) for a tasty stuffing without the extra meat. Since you’ll be getting plenty of protein from the huge bird sitting on the table, a meatless stuffing won’t kill you. Improve upon this recipe even further by substituting the chicken broth for low-sodium vegetable broth. Adding a vegetable side to the Thanksgiving spread is a great way to increase the nutritional value of the celebratory feast. If you’re going to fill up on food, why not throw some vegetables in the mix? They do not have to be boring either. Brussels Sprouts with Pancetta and Rosemary is an example of a side that is both delicious and nutritious. 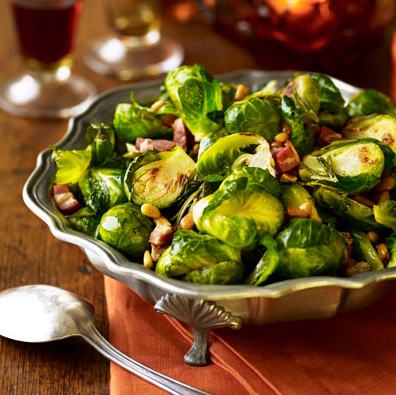 While the thought of brussels sprouts may send some people running, they are delicious when cooked with other flavors and with the salty taste of pancetta. Cut down on the pancetta usage and use a more pure oil (olive oil would be great) to make this recipe even healthier. You could also try some steamed green beans with shallots. Cranberry sauce has the potential to be really sweet or really sour. Cranberries are naturally bitter, so when making a sauce, it is important to include enough sugar to balance the tartness. Homemade cranberry sauce is less likely to contain too many unhealthy ingredients because you are the one making it. The less ingredients, the better. This recipe contains only three ingredients, and one of them is water, which will not tip you over your calorie limit. The optional ingredients all provide a lot of flavor but only a little calories. To health-atize it even more, cut down the sugar to 3/4 or 1/2 cup and try using raw sugar. Gravy Try something different this year with cider gravy. It uses both apple cider and cider vinegar to give it a tangy autumnal taste. Instead of using the Turkey Giblet Stock, substitute with low-sodium vegetable or chicken broth. This will give the turkey a real fall twist. Pumpkin Who says a pie needs a crust? Crustless pumpkin pie is just as mouthwatering as the traditional version but with less calories. You can even get creative and add a little chocolate. Yum! Apple Nothing says America quite like homemade apple pie and nothing says heart attack more than shortening. Try substituting some of these ingredients instead. Butter is one of the most popular substitutes, but if you want to get even healthier, try coconut oil or palm oil shortening. Using these simple tips will make it a little easier to recover from the food overload during this holiday season.